Behind our home is a beautiful maple tree. My neighbor recalls planting it over twenty years ago as a sickly sapling in memory of his dog that had died. It has now matured and has a lush symmetrical shape. 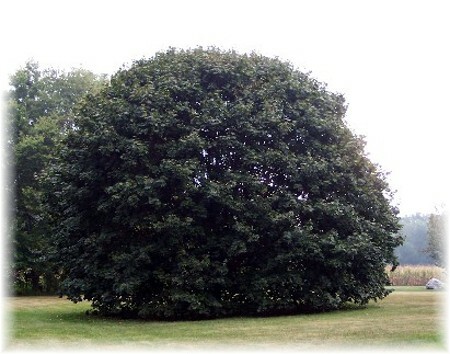 In fact it looks more like a huge bush than a tree. But it has stout branches good for climbing and of course the children are drawn to this. Several days ago I was out with Brooksyne and Ester. I climbed up into it, although not nearly as high as I would have climbed a tree many years ago as a kid! I enjoy studying trees and have been blessed with the friendships of many foresters and loggers, especially when I lived in the "forest haven" of northern Pennsylvania. Trees are referenced throughout the Bible from the very first chapter to the final chapter. I have even done a study of famous trees in the Bible. But I suppose if I was to query Bible students I would find the most famous tree is the Sycamore that Zacchaeus climbed to see Jesus. I like that story, don't you? You may also recall this story from Sunday School or VBS. And I bet most of you have climbed a tree and can smile as you remember. But Zacchaeus wasn't climbing a tree for the fun of it. He wanted to see who Jesus was! It doesn't seem like a very dignified position to find a rich man sitting up in a tree, but the story indicates he had a spiritual interest and that's a good motivator. I suspect his position and wealth had not met his innermost needs. I wonder if he really cared that much what other people thought. "When Jesus reached the spot, he looked up and said to him, 'Zacchaeus, come down immediately. I must stay at your house today'" (Luke 19:5). I don't think that's what Zacchaeus was expecting and so often the Lord meets and calls those who are seeking Him in ways we do not expect. And He's still doing that today, for He continues to reward those who earnestly seek Him (Hebrews 11:6). Let's seek Him today! Brooksyne's prayer - "Jesus, You see me in my hour of need. You look beyond my supposed prestige, my accumulation of wealth, and my earthly accomplishments. You perceive my thoughts from afar. Lord, as You turn on the search light of my heart You reveal to me anything or anyone that separates me from You. Thank You that I can be reconciled to You, Lord, and experience forgiveness for my sins through Your redeeming blood. The riches of Your grace far exceed the fleeting riches this world has to offer which can lead to spiritual bankruptcy. You lead me in the way everlasting as I earnestly seek You." The Biblical story of Zacchaeus recorded in Luke 19:1-10. Update on Mom – Several weeks ago I shared how my Mom had severe health needs requiring a lengthy hospitalization. She came home from the hospital on September 3 and we are seeking to care for her at home as long as we are able. Brooksyne is taking an especially heavy load. Mom is 84 and like all of us her life is in God's hands. She is very weak, has very little appetite and sleeps most of the time. Her family doctor saw her yesterday and was concerned as he could see she is not improving as quickly as we had hoped. We do appreciate your prayers and notes of concern. We've also experienced such kindness from church friends and neighbors who have called on her and helped sit with her when we have to be out.